Welcome to the “Far Side of the World”! Two large islands with a strong difference in their landscape: graceful volcanoes, lush meadows and dream beaches in the North Island; the high ranges of the Southern Alps and a rugged coast line pervaded by fjords and sounds in the South Island; friendly and open minded people with a great respect for the culture of the native Maori  all this is on offer “down under”  plus, of course, an exciting 3 feet 6 inches “Cape Gauge” railway network. The history of New Zealand Railways dates back to1863 and by 1873 the Cape Gauge had been established as the standard gauge for the track. The New Zealand Railway system which was already under state control before the First World War reached its ultimate size in the 1950s. The following further development of the road system meant the end for some light railway networks. However, the establishment of a railway ferry service between the North and the South Island in 1962 boosted another growth. 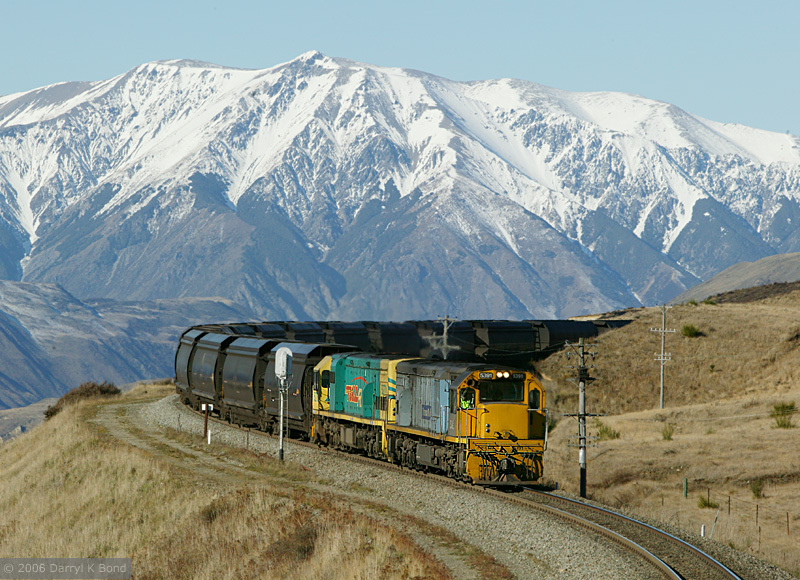 New Zealand Railways then followed the almost worldwide trend of “slowly but surely” down-sizing. 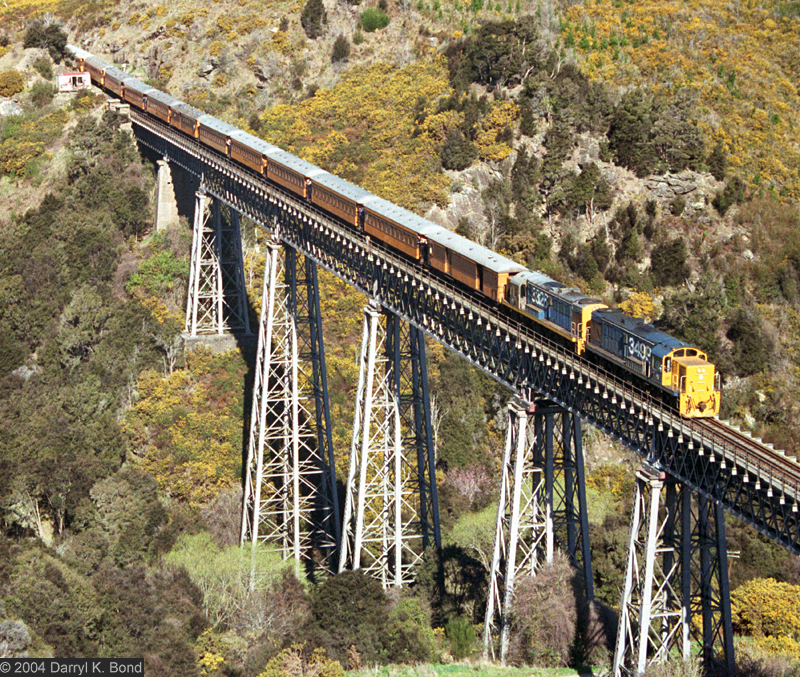 It was also “very trendy” in 1990 to change to a government owned commercial company  New Zealand Rail Ltd. The down turn accelerated after the complete privatisation of the railway in 1993 (“Tranz Rail” from 1995). Since 1st of July 2008 the railway company has been totally back under state control. The birth of KiwiRail (the transportation company) and Ontrack (the infrastructure operator since 2003) has been quite a reason to celebrate, as we realized during our process of preparation for this trip. 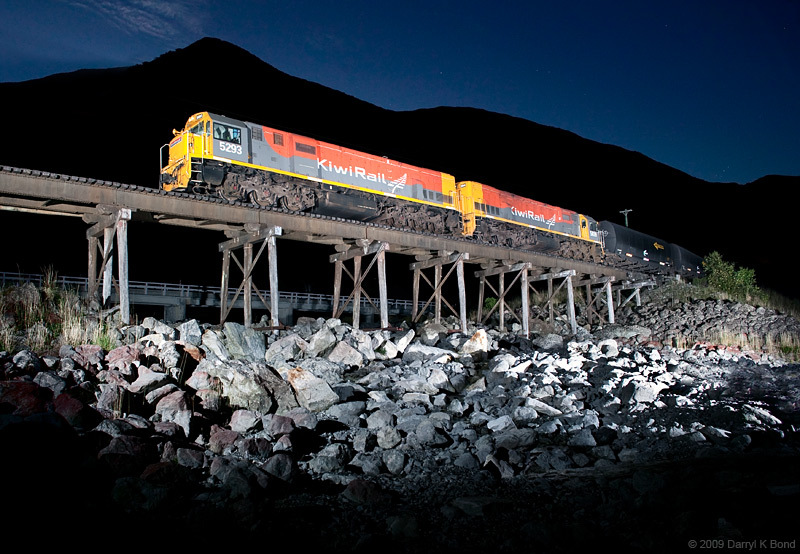 KiwiRail and Ontrack with their strategies to revive railway transportation were popular with the people of New Zealand and have their support. Two-thirds of the population welcome the conservation and development of light railway lines to cater for freight transportation and to relieve congestion on the roads. Additionally, the ARTA owns 19 diesel multiple units (being operated by “Veolia”), which they had purchased second hand from Australia in 1993. In 2010 the vintage electric units of the Wellington suburban railway (series D/DM; built in 1938) are due to be replaced by brand new “Matangi”-Railcars (series FM/FT). 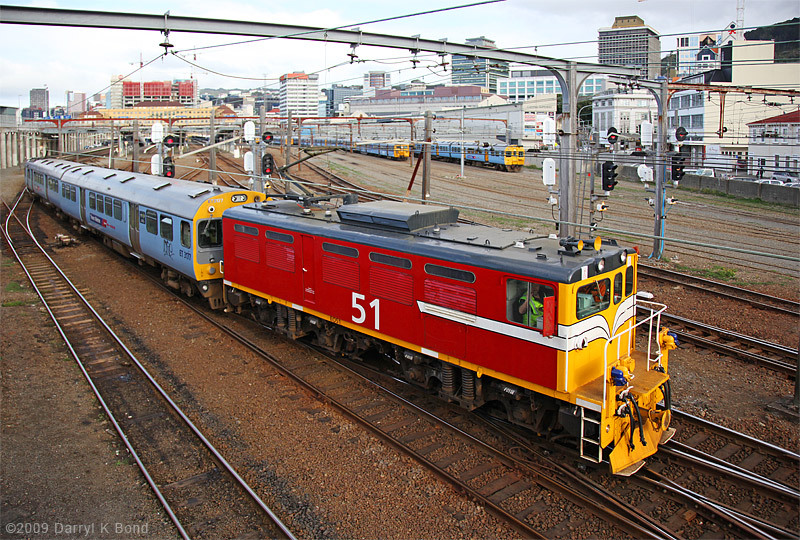 At the same time 20 Chinese built locos are being purchased by KiwiRail. They are to be used on “MetroPort” trains between Auckland and Tauranga/Mt. Maunganui and also on milk trains to the Fonterra factory at Whareroa near Hawera. It is expected that the Class DFTs released from milk train duties will be used by ARTA and this will release the older Class DCs for possible use elsewhere. This will speed up the process of withdrawal from service of older units of the state-owned railway. Because of this, the timing of our trip is a good choice. We can still experience a wide range of these well-tried units, which are partly in their old livery. If we are very lucky we might be eyewitnesses to the trial runs of the first new machines purchased for the railway in decades. The “KiwiRail” management is being very open minded regarding our journey. 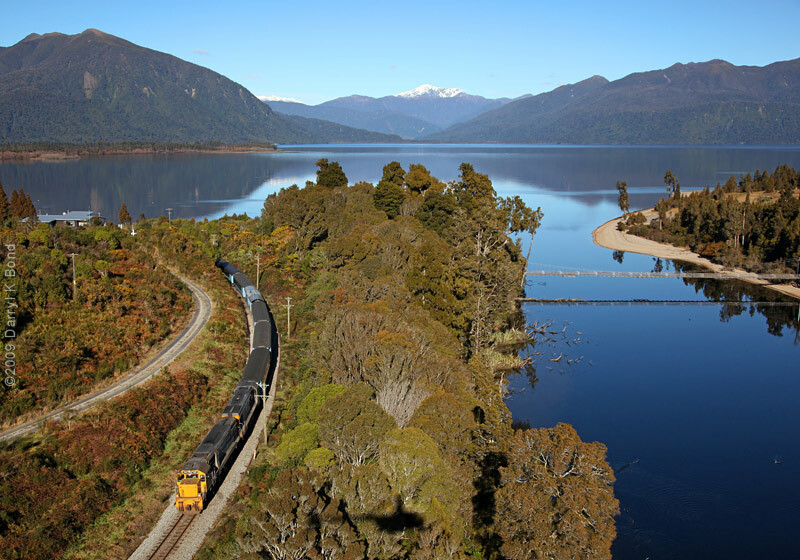 We were told that we are the very first to go on such a big expedition to discover New Zealand’s rail network. After a long flight to the South Island of New Zealand and a little bit of time in Christchurch we start our tour with a comfortable train trip on the “TranzCoastal” from Christchurch to Picton where we will take the ferry from Picton to Wellington, the capital city of New Zealand on the North Island. We then continue our journey to Auckland, the largest city in New Zealand, with another relaxing train trip on the “Overlander” from Wellington. Thus you can adjust to your jet leg and the time difference in a relaxed manner while enjoying your first impressions of the beautiful countryside of New Zealand and last but not least have a glimpse at some striking photo spots you will discover oer the following days. Starting at our destination, Auckland, we travel on a charter bus across both islands. Following the most important rail lines we keep an eye on the train traffic and are permanently on the lookout for the best photo and film spots. 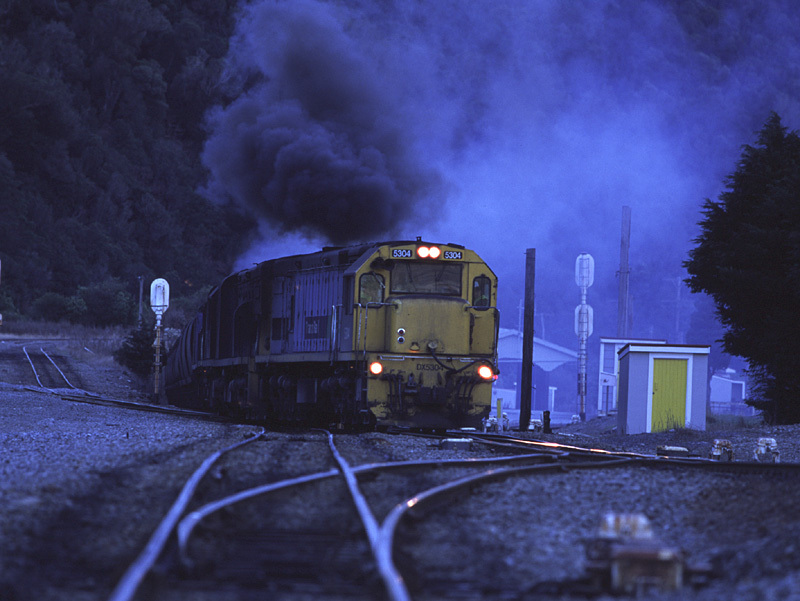 Not only will we have the chance to meet people in freight yards and loco sheds, we will also visit the “Glenbrook Steelworks” near Auckland with its industrial railway and have permission to visit both railway repair centres, “Hutt Workshops” in Lower Hutt near Wellington and “Hillside Workshops” in Dunedin. 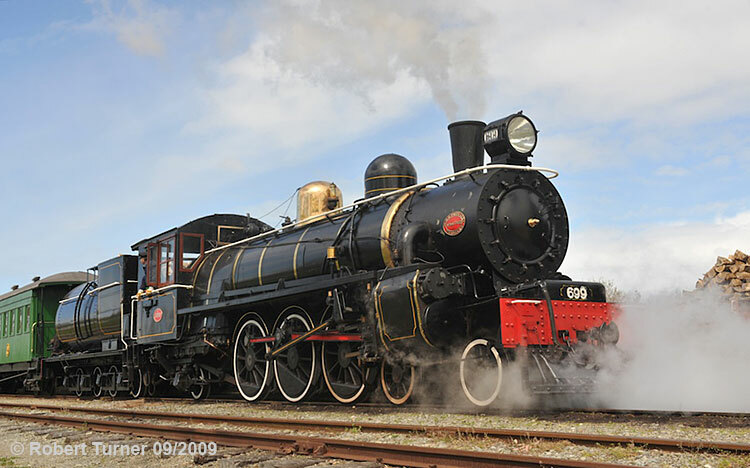 The workshops have a long tradition of constructing and building locomotives, carriages and wagons and there are attempts to re-establish the construction of locomotives and railcars in New Zealand instead of importing these machines from China. Furthermore we will look at the transport of timber and paper to and from the biggest paper mill in the Southern Hemisphere at Kawerau. The many ports of New Zealand are of immense importance for the economy of this country. We will immerse ourselves extensively in the project of the loading and shipping of freight trains during our trips between the North and the South Island. The highlight of our travel is certainly the transportation of coal in the South Island. 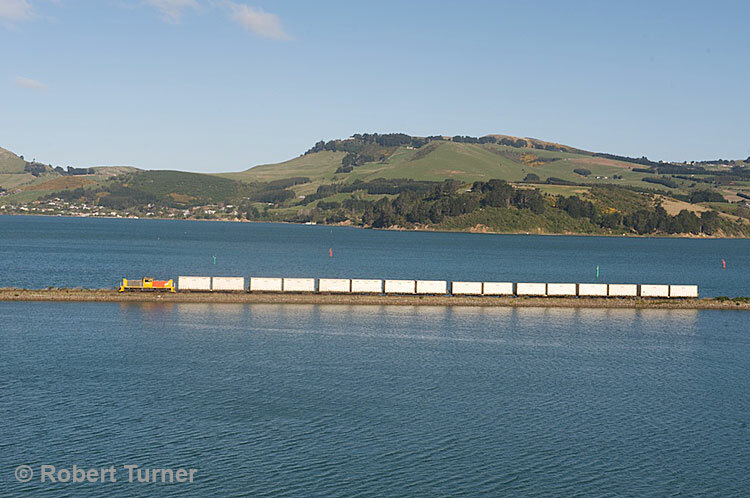 We follow the entire route of transport from the coal terminal to the port of Lyttelton, which is the harbour for Christchurch. Here the “Black Gold” is loaded and shipped to China. 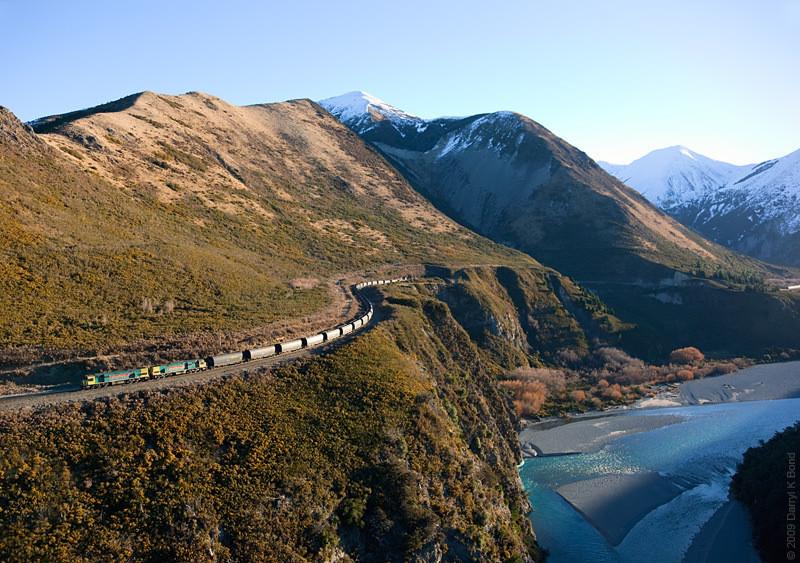 This just suits us: the heavy coal trains have to be hauled by several diesel locomotives to get across the Southern Alps. Tunnels, gorges, dams, viaducts across torrential rivers  and above all the grandiose mountain scenery! This season of the year has the colours of changing foliage and snow-capped mountains on offer for us. Our time of travel is known for relatively stable weather conditions, so there is a fair chance of catching intensive contrasts to the blue sky. Finally, enthusiasts of commuter and suburban transport will get their money’s worth. We will travel on the last remaining operating city tramway in New Zealand  the historical tram in Christchurch  which is now operated as a tourist attraction. On tour from the suburban station of Plimmerton to Wellington we get an insight into the quality of transportation of TranzMetro, the electric suburban railway network for the capital. By contrast, the public metropolitan and suburban commuter railway system for the greater Auckland area is structured completely differently. Here the international company ”Veolia” is in business. They work with diesel multiple units and diesel loco powered push-pull trains. What would a trip to New Zealand be without a look at the dedicated preservation of railway tradition? Hence we have two especially interesting historical railway sections on our list for the additional tour program. 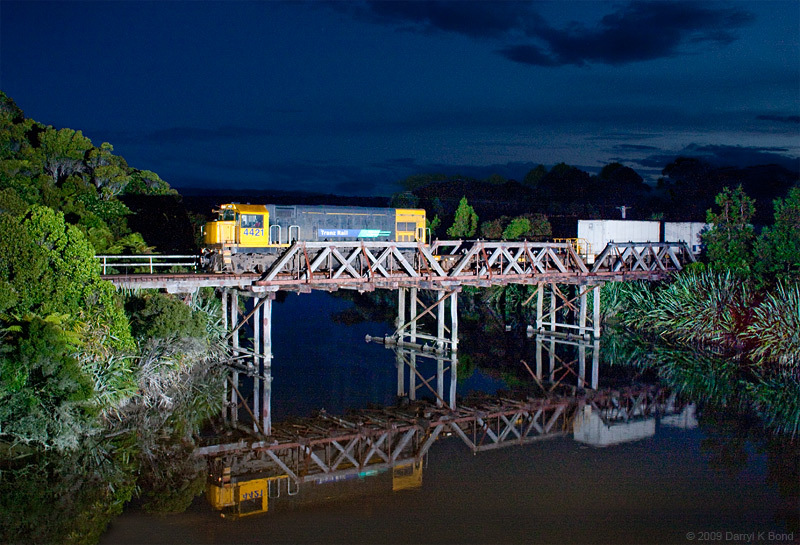 The Taieri Gorge Railway based in Dunedin offers superb diesel loco sounds from two classes out of service with the state’s railway by 1990. Six locos of the DJ-series (built in 1968) with the Bo-Bo-Bo wheel arrangement, typical for Mitsubishi, are complimented by a Class DE (Bo-Bo, built by English Electric, around 1953). The route through the Taieri Gorge via Pukerangi to Middlemarch is absolutely stunning; on the way out we should have particularly favourable lighting conditions and the train will stop, at several beautiful places, for us to take pictures. The Taieri Gorge Railway uses the impressive passenger railway station in Dunedin, which is otherwise not used any more by rail travellers and is one of the most beautiful station buildings in the world. We are invited to the loco shed for a photo session and an “insider-exchange” of experiences. Eventually at Glenmark/Waipara near Christchurch we will experience the smell of steam. 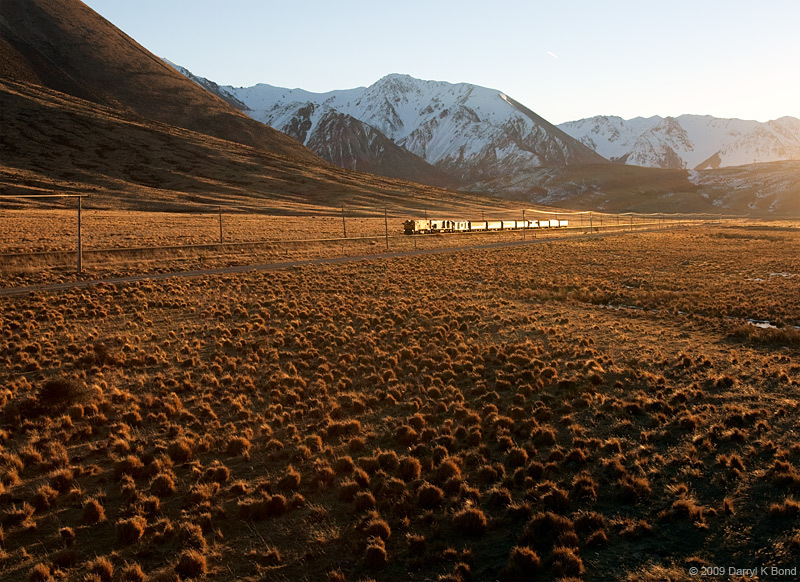 The vintage train of the Weka Pass Railway travels a twelve kilometre long portion of line between Glenmark and Waikari, through scenic countryside. The beautiful 4-6-2 express loco of Class A no. 428 (built in 1909) survives there and is still active. On some occasions a vintage diesel electric loco of the DG series (built by English Electric in 1956) takes over  a very British design with a phenomenal sound. The train shuttles twice between Glenmark and Waikari and offers us a lot of opportunities for track photography or to take a ride. Maybe you experience the same problem: “My partner accepts my hobby, but doesn’t want to let me go for such a long time on my own ...” The solution: Just take your “better half” with you! Our accommodation of choice (Hotel or Bed & Breakfast) is usually in the 3-Star range; only in exceptional cases  where there is no alternative  we will stay in a simpler place. In Hamilton, Christchurch and Dunedin we have the opportunity, to spend the evening as we please. For those members of the group who are tired of train-spotting Nature-TrailZ is happy to organise touristy adventures “off the railway track”. Our own travel programme already contains some surprises: We will experience the culture of the native Maori in one of their villages, visit the Moeraki Boulders, enjoy a nice meal in a famous fish restaurant in the near-by fishing village of Moeraki and twice will have the chance to relax in thermal pools in the evening. Would you like to extend your time “down under”  maybe to see some more landmarks and points of interest in this country or maybe to spend a week at the beach, e.g. in the Cook Islands, unwinding and contemplating the universe? Good idea, because Nature-TrailZ offers a whole range of options. You don’t get enough time off? No problem: we will give advice and provide ideas for an individual shortened version of the tour with an adequate price structure. Our stopover locations in Wellington, Auckland, Christchurch and Dunedin allow for transfers to and from airports. We are happy to help with the arrangement of your flights. The great mainline of the North Island is extremely diversified, both with regards to the countryside as well as to the operational aspects. It is travelled in full length by the express train the “Overlander” and a number of freight trains. At Paerata the Mission Bush Branch diverts off to the West at a “track triangle” to cater for the industrial traffic to the Glenbrook Steelworks. “Veolia” with its diesel driven commuter trains operates from Auckland to Pukekohe under contract with the “Auckland Regional Transport Authority”. The trunk follows State Highway 1 down to Hamilton in a relatively unspectacular manner. 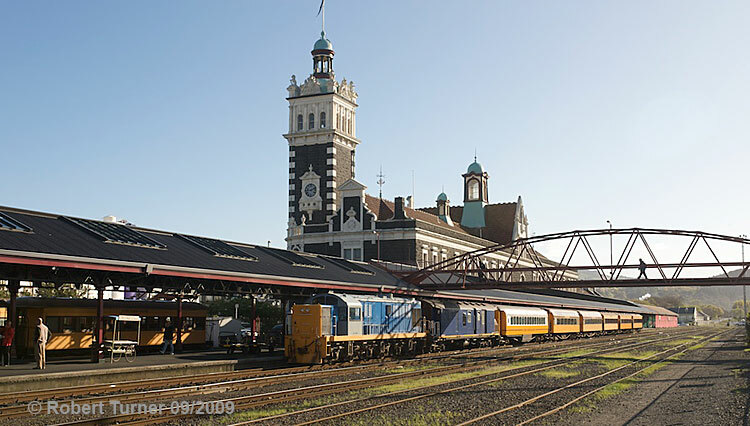 Te Rapa, the freight yard at Hamilton, is the largest freight train hub in the country and therefore the most important one in the North Island. It is here where most freight trains heading south change their locos from diesel to electric. The 412 kilometre long track to Palmerston North is topographically quite demanding and has been electrified with 25 kV / 50 Hz single phase. At Okahukura the track of the Stratford-Okahukura-Line leaves the NIMTR and heads west. The mountain range we crossing here has volcanic origin  near Tongariro-National Park the 3 volcanoes Tongariro, Ngauruhoe and Ruhapehu dominate the scenery. Gigantic civil engineering structures had to be built of which the Raurimu-Spiral is one of the most famous in the country. 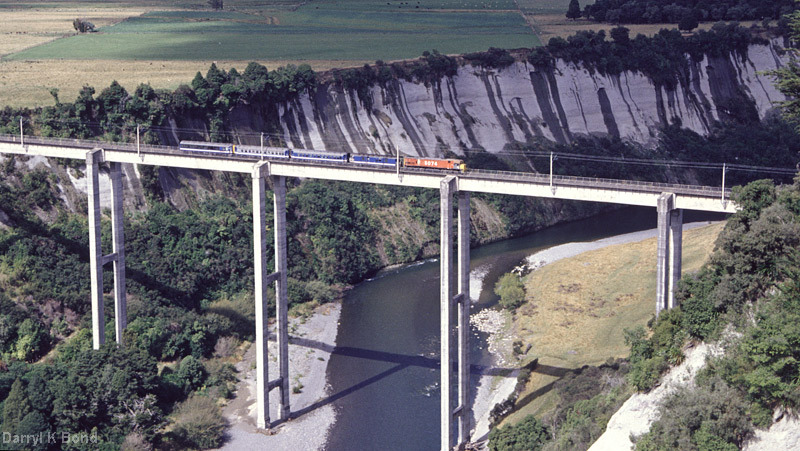 Diverse viaducts include - (length/height): Makatote (262/79 m), Mangonuioteao (91/34 m), Hapuawhenua (41/47 m), Toi Toi (59/58 m), North Rangitiki (181/77 m), Kawhatau (181/72 m) and South Rangitiki (315/75 m). We also find spectacular curve constructions in this area  the “Turangarere horseshoe” and the Mangaweka-curves. Further south, mainly in coastal lowland areas, the Marton-New Plymouth-Line branches off to the west; a little later we reach Palmerston North, the second important en-route station. 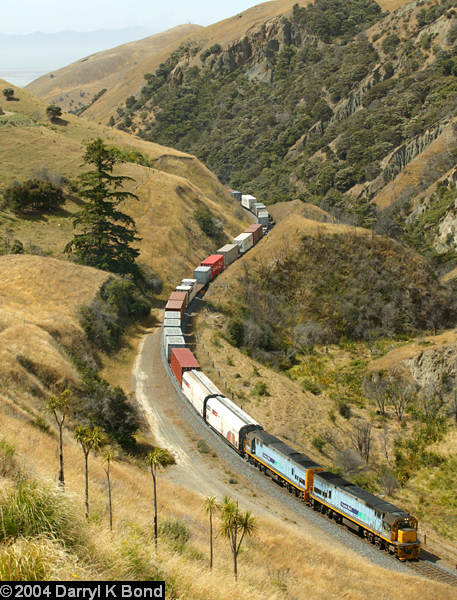 Here trains change back from electric to diesel loco; and the Palmerston North-Gisborne-Line branches off to the east. Shortly beyond Paraparaumu the NIMTR reaches the west coast; between Plimmerton and Porirua we cross an arm of the sea. Plimmerton is also the station, where the electrical metropolitan commuter railway system TranzMetro starts, a subsidiary of KiwiRail. The line of the trunk into Wellington is electrified at 1,500V DC. 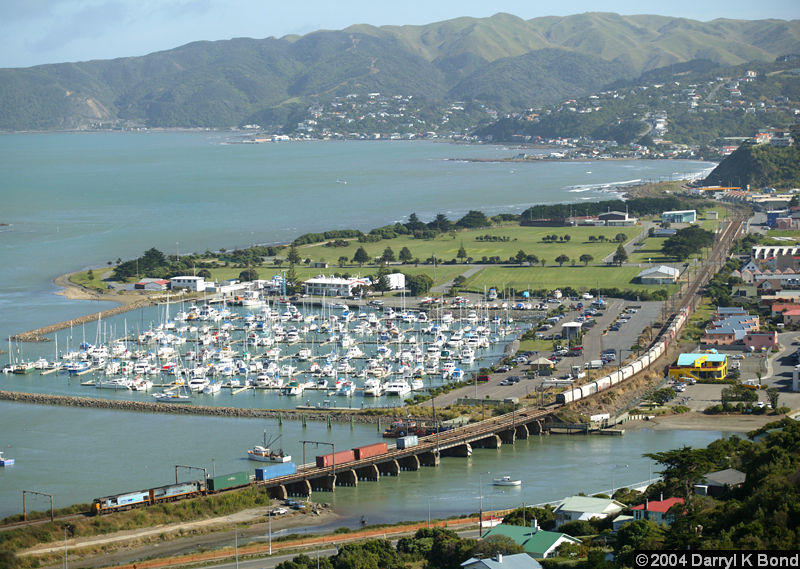 Wellington is the final destination for the “Overlander” and the TranzMetro-trains, though freight trains and travellers can take the ferry to get to Picton on the South Island. This trunk is used by freight trains only and serves mainly the port of Mt. Maunganui and the paper mill of Kawerau. 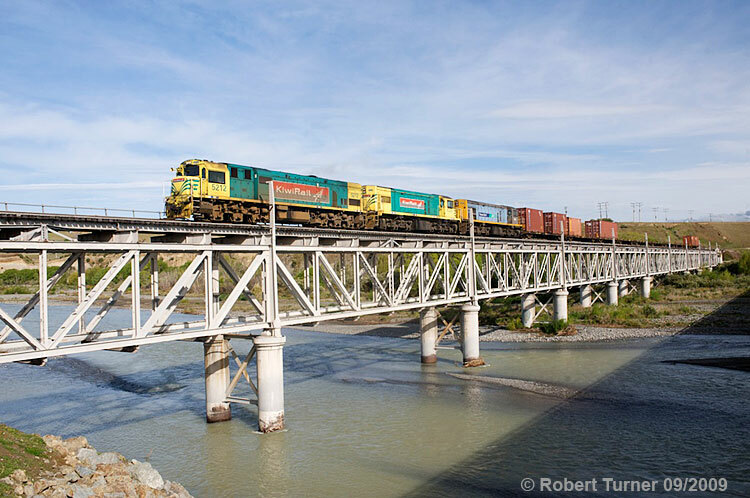 Main hub for the freight trains is Te Rapa at the NIMTR. Through the plains it continues to Morrinsville, where the roughly 20 km long Waitoa Industrial Line branches off with a privately run railway service. After a turn to the southeast we reach the junction station Waharoa. The Kinleith Branch continues straight on and is operated be the Kinleith Mill itself. The ECMTR turns again towards the west. Now the landscape is changing dramatically. The 8.85 kilometre long Kaimai-Tunnel is the longest in New Zealand and is used to master the Kaimai Mountain Ranges. Coming back into daylight we get a view of Tauranga Harbour at the Bay of Plenty. We have to cross several bridges in this bay and the traversing to Te Maunga is very obvious. Here the dock railway of Mt. Maunganui has its start. In the area of Te Puke the ECMTR runs briefly inland and then follows the coastline from Otamarakau to Matata. By branching off to the south at a right angle the trunk reaches Kawerau with its paper mill after 30 km. The branch line to Murupara also ends here at the railway station, which is located right in front of the factory gates. The MNL is basically the extension of NIMTR in the South Island, and the “TranzCoastal” allows us to continue our travel from Auckland and Wellington to Christchurch. Picton’s importance as a ferry port is due to the fact that it is located in the most suitable area in the Charlotte Sound to cater for big railway ferries. The provincial town of Blenheim is significantly larger and has a small feeder line. The most impressive bridge construction is the Double Deck Truss Bridge across the Awatere River in Seddon built in 1902 (today only used by the railway). Lake Grassmere at Clifford Bay is known for its desalination plant and is separated by a railway dam. However it still takes more than 20 kilometres, until the track finally reaches the coastline. With the exception of beach town of Kaikoura it stays now in full view of the ocean. At Clarence we cross the river of the same name near its estuary. The railway continues southwards along the coast through Kaikoura to Claverley where it turns westwards inland along the Conway River Valley before turning South once again towards Christchurch. The MNL now travels parallel to the coast, but inland, until Christchurch. 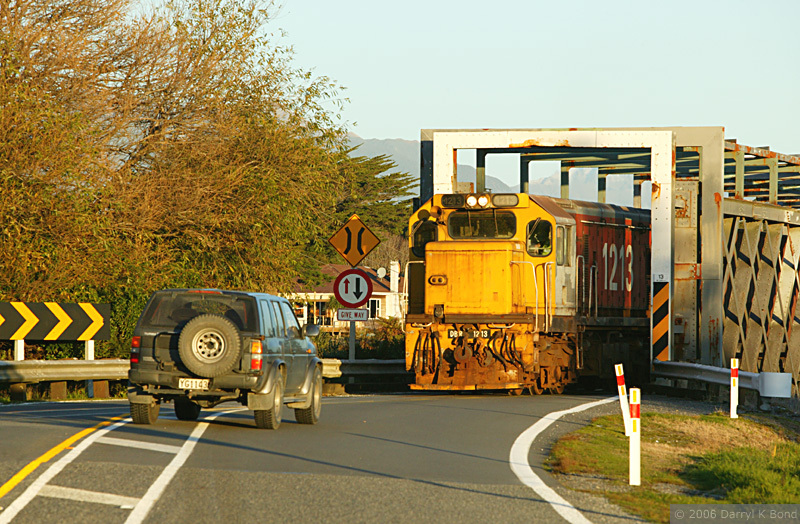 At Waipara the “Weka Pass Railway” branches off  now only used as a tourist attraction. 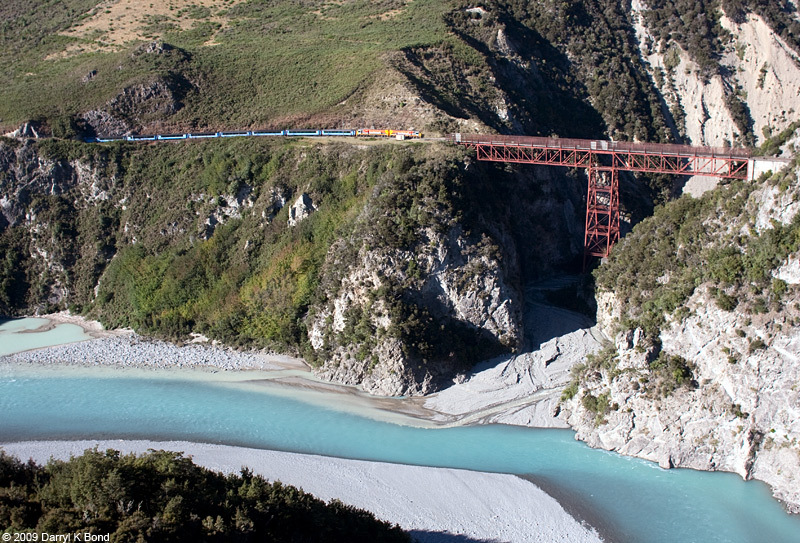 Further highlights are the bridges across the “Waiau”, “Hurunui” and “Waimakariri” Rivers. The freight yard at Christchurch takes care of the distribution of the freight trains to the Main South Line to Dunedin, the Midland Line across the Southern Alps to Greymouth and the direct connection to the Port of Lyttelton, the harbour for Christchurch. This line, probably the most impressive trunk of New Zealand’s railway, has only the status of a “Secondary Main Line” but is definitely on a par with the great main lines in its capability and performance, especially when it comes to engineering and beautiful countryside. The ML obtained its importance through rather strange circumstances. Coal from the rich mines near Greymouth, Brunner and Reefton, had already been exploited in the 19th century and needed to be distributed to the rest of the country. Also when huge amounts of coal were sold for export to Japan and China it would have been logical to ship the coal direct from the West Coast but there was no deep-sea port. A proposed new construction based on a pontoon structure never came about. Therefore the Midland Line had to step up and take the burden, to carry the coal to the port of Lyttelton, on the East Coast, which had been developed and reconstructed accordingly. 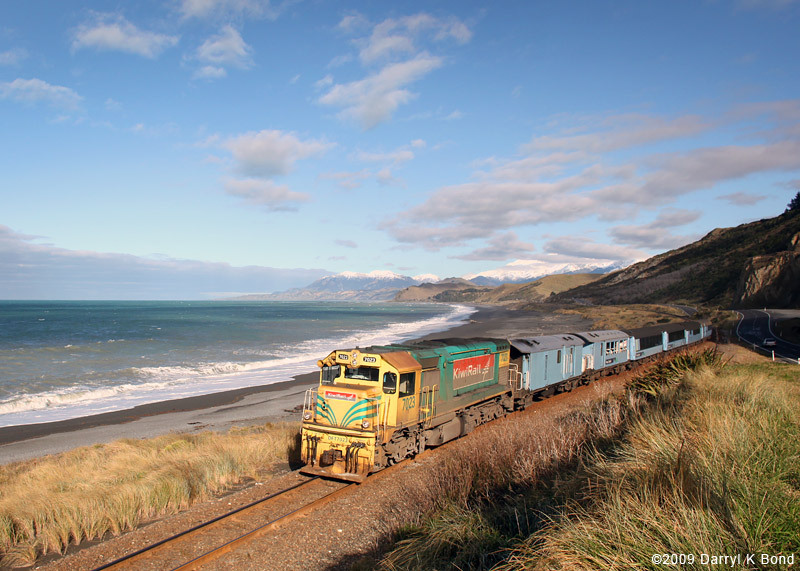 Greymouth is the final station for the branch terminal lines from Hokitika and Rapahoe. From here we first follow the Grey River to Stillwater Junction passing the long decommissioned Brunner Mine, then the branch track via Reefton and Westport to Ngakawau and an important timber terminal. Slowly but surely the track starts to ascend into the Southern Alps. Insiders judge the railway station of Moana as one of the most beautiful stations in the country because of its prominent location. Later on we reach Otira in a narrow deep notched valley flanked by the peaks of Mt.Rolleston (2,275 m) and Mt.Franklin (2,145 m). 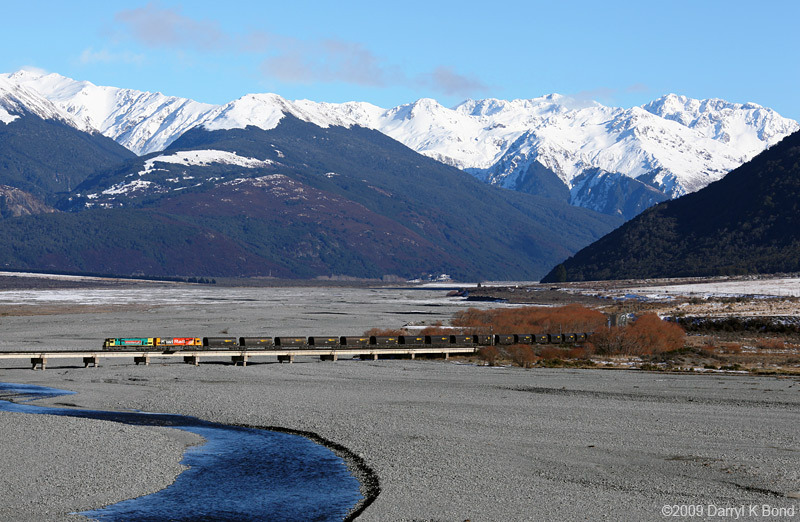 The area at Arthur’s Pass is steep and a dreaded weather lab and an 8.55 kilometre long tunnel had been built at the base to cater for the crossing under the pass. The operation of steam locos proved to be very difficult; therefore the tunnel section between Otira and the station at Arthur’s Pass was electrified in 1923 at 1,500V DC. In the 1990s diesel locos took over and electrical operation was abandoned. Because of the steep ascent of 1 in 33, the freight trains have to be helped by additional locos. Downhill to the east from Cora Lynn onwards the track more or less follows the Waimakariri River. The 256 m long bridge across the river before Cass is very impressive and stands out against gigantic mountain scenery. From here onwards the Midland Line passes through unaccessible open country. Demanding steep inclines up and down must be overcome since the location of the line could not be traced out continuously in river valleys. There are several steel viaducts and the one across Broken River is the most distinguished. After we leave the mountain region the character of the landscape changes dramatically. The trunk now passes through cropland for a longer period and follows State Highway 73. From Rolleston to Christchurch and on to Lyttelton the Midland Line and the Main South Line are combined. New Zealand (Population 4.3 Million) is a member of the British Commonwealth. New Zealand uses Standard Time = UTC/GMT + 12 hours (November until end of March). Because of daylight saving in Europe and New Zealand it changes to +11 hours from end of March until end of September and +12 hours in October, depending on the time zone in Europe. They use the same voltage as in Europe (230 V, 50 Hz) but you need an adapter for their sockets. New Zealand has quite a good coverage for mobile phone networks like Vodafone. It is easy to get a prepaid SIM card. Other options are Pre-Paid-Phone cards, which can be used at any phone for local or overseas phone calls. New Zealand Dollar 1 NZD = app. £0,46 (August 2010). MasterCard, Visa and American Express are accepted. Travellers Cheques can be changed everywhere and you can also use your EC Card with the Maestro Sign at many ATM machines. The daily limit is normally 800 NZD, but please be aware, that the ATM’s can have other limits for cash withdrawals for safety reasons and also that banks usually put a limit on the amount to be withdrawn. Take enough batteries, film rolls and memory cards with you  they are more expensive than in Western Europe and it gets more and more difficult to get films. Because New Zealand is located in the Southern hemisphere the seasons are opposite to Europe. The north of New Zealand is subtropical and the south temperate. In summer, the average temperature ranges between 20 to 30°C and in winter between 10 to 15°C  in both seasons a little bit warmer than in Central Europe. Precipitation is constantly distributed in all seasons; it rains often but our time of travel is known for relatively stable weather conditions. Because of the extremely thin ozone layer sunscreen protection is highly recommended. In autumn, our time of travel, warm days are possible. But a warm jacket, a sweater and stockings should be included in your luggage, because in the evening and in higher altitudes the temperatures become much cooler. You may also need a raincoat or an umbrella, sunglasses, hiking shoes and outdoor clothing. New Zealand is one of the safest travel countries in the world. British citizens will need a passport valid for at least three months after return date and a valid return flight ticket. A visa is only required if you would like to stay more than three months. Please note, that some stop-over destinations might have different regulations. If you travel straight from Europe to New Zealand, no vaccination is required. The health care system in New Zealand is very good. We recommend you take out medical travel insurance, since there is no agreement between New Zealand and many European countries. Please bring your own imperatively needed medication  not everything is available in New Zealand. Prescription medicine is allowed to be imported. New Zealand has very strong quarantine rules. No food, animals or plant products are to be imported under any circumstances. When leaving New Zealand usually a departure tax of NZ$25.00 per person applies. This fee is not included in your flight ticket and will have to be paid extra at the airport. Personal expenses such as telephone, mini bar in the hotel, laundry service etc. Above prices are based on specific bookings with the respective airlines, which have to be confirmed well in advance. Your early booking is hence appreciated. As a service to our UK-based clients FarRail Tours accepts and will continue to accept payments made out in Pound Sterling until further notice. However, please note that from January 28, 2009, all prices quoted in Pound Sterling are indicative only and are subject to change without prior notice. This measure was taken by FarRail Tours due to the unprecedented volatility in the international foreign exchange markets and its impact on the valuation of the Pound Sterling versus other major currencies, specifically the Euro as FarRail Tours' accounting currency.